Examples of 3D support material usage. A: Cranium and mandible of Gorilla gorilla (adult, male). Left: the 3D model of the skull is transparent, showing where the 3D support cylinders have been placed in order to connect the mandible and the cranium. Middle: the same 3D model is rendered opaque. Right: 3D printed object. 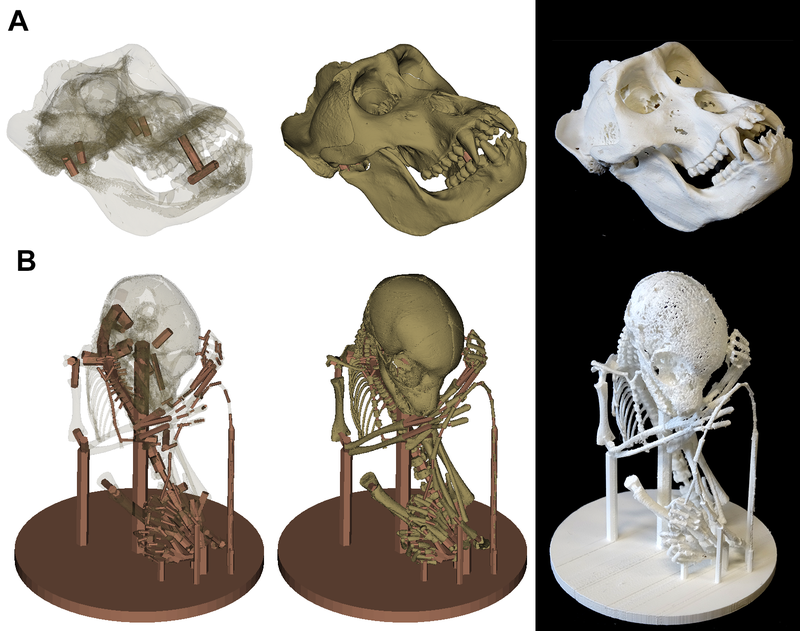 B: 3D model of the skeleton of a newborn Lemur catta. The skeleton of this neonate specimen contains many non connected elements: many bones are not fully mineralized (skull bones, vertebrae) and most bones are separated in space. Left: the 3D model of the skeleton is transparent, showing the position of the many cylinders (two hundreds) of different lengths and diameters connecting the different bones. Right: 3D printed object. Left: enamel thickness false colour representation of a human upper right second molar (SP07 from Sains-en-Gohelle; image credit, Mona Le Luyer, PACEA, Bordeaux). Right: enamel dentine junction curvature false color representation of the same specimen. Left: cranium of a juvenile Mus musculus. Each bone was tagged using a different colour. Right: cranium of an adult Mus musculus. Bones were tagged using the same colour code in the 2 specimens. Not to scale. Left : cranium and mandible of the type specimen of Pan paniscus (downloadable at http://www.metafro.be/primates/panpaniscustype ) rendered transparently. Right : the same skull viewed using a clipping plane placed at the position of the saggital plane, revealing inner structures such as the endocranium cavity. Left: bone thickness false colour representation of the cranium belonging to a specimen of Microcebus murinus. Right: each bone was tagged using a different colour on the same cranium of Microcebus murinus. Left: Landmark digitization on a Mus musculus skull. Right: curve digitization on the right inner ear of the same Mus musculus specimen. This figure represents the three-dimensional reconstruction of the skeleton of Canariomys bravoi, the giant rat of Tenerife (Canary Islands, Spain) based on the specimens TFMCV872 and TFMCV873.